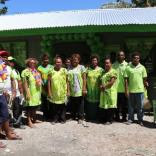 Since the first Bank of South Pacific (BSP) community project was handed over from the Wabag Branch in April, there have been a total of 26 projects completed and delivered by the bank's staff to date worth over K650,000 as of October, 2017. Each year, BSP makes a commitment to giving back to the communities that we live and operate in. The contribution is simple, the work is voluntary and each time, we hope to leave lasting changes that make a difference in the lives of everyday people. The bank's Community Projects in 2017 has been centred on the theme, "Empowering Women and Children", in which 49 projects had been identified and carried out throughout PNG. The BSP Community project involves staff from branches, Sub branches, Business Units and Subsidiaries from across Papua New Guinea, and the region; who come together each year to deliver one project to a community. The projects are typically focused on Health, Sports, Environment, Education and Social wellbeing. On Saturday 7th October, 2017, BSP Rabaul Branch handed over its community project to Napa Par Health Centre in the Gazelle District of East New Britain. The Staff engaged in assisting a local contractor in the maintenance of the Health Centre's ablution blocks. This was followed by Mt. Hagen and Kundiawa branches who handed their community projects respectively on Wednesday 11th October, 2017. Mt Hagen branch Painted the Women's Well Clinic and donated furniture and computer sets as well. In Kundiawa, branch staff installed three new water tanks and a pump at the Kundiawa Urban Clinic giving clean access to water for mothers and children. Furthermore, our Lihir Branch renovated a Kids Centre at the Kunaye Adventist Church in New Ireland Province on Sunday 15th October, 2017. The Project was handed over by the BSP Lihir Branch Manager, Kalat Tiriman who encouraged the community to look after the facility and said that, "This project gives the children in this community a great area for church programs and activities to be organised and carried out." BSP is expected to handover 23 more community projects upon completion this year.